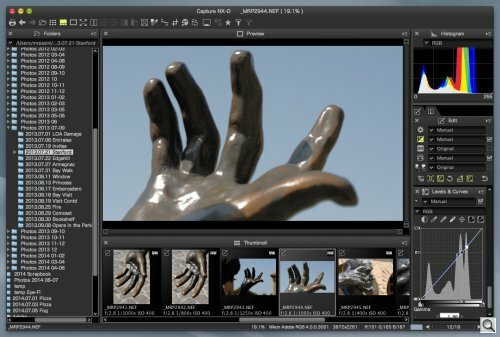 Nikon has officially released Capture NX-D v1.0.0, its image processing software written by Silkypix. The application, which also supports JPEGs and TIFFs, is available as a free download from your regional Nikon site. Capture NX-D. Browsing a directory of Raw+JPEG Nikon images. 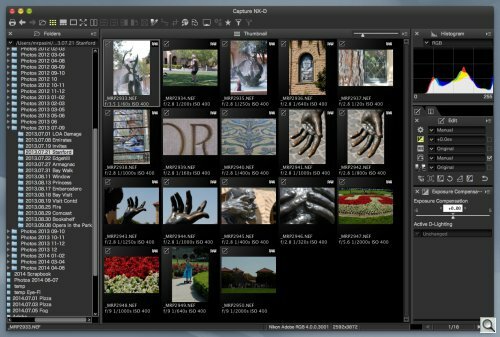 Capture NX-D is a software application developed to allow users to enjoy full-scale development of Raw images with simple operations. It enables high-quality photofinishing of images captured in Raw format by Nikon dSLR cameras, Nikon 1 advanced cameras with interchangeable lenses and Coolpix compact cameras that support this capability. The application will be available for download, free of charge, to allow those who own a Nikon camera to more thoroughly enjoy developing Raw images. The under 300-MB download includes Picture Control Utility 2, replacing Picture Control Utility 1, which can't be launched from NX-D. Picture Control Utility can create custom Picture Control settings, which can be shared among most Nikon dSLRs, Nikon 1 series cameras and the Coolpix A. 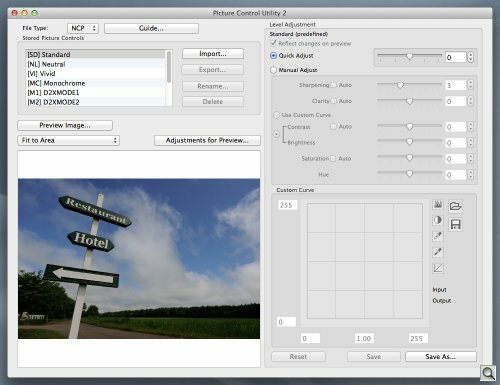 Picture Control Utility 2. The new version can be launched from NX-D. The installation notes also advise that adjustments made with beta versions of NX-D are not supported. And that using the noise reduction tool can crash the program. We installed both NX-D and Picture Control Utility 2 on a MacBook Pro running OS 10.7.5 with no issues. On launch we noticed the working window was pretty cramped with fairly unsophisticated icons and a less-than-elegant font. Enlarging the window full screen didn't help that. It's really a user interface design issue. Or lack of design. Editing in NX-D. Cramped controls made it difficult. Tool icons turn yellow when adjustments have been made. The tool palette at the default size, though, is hard to work with. With any tool, you want the largest rendering possible to make finer adjustments. You can undock the palettes but you can't make the sliders wider. The Show Focus Point Tool has survived in the Image menu, showing you what part of the scene the camera focused on. You can also synchronize edits, saving time in batch processing. Edits are saved in an .nksc XML file associated with the main filename in a subdirectory of the image directory named NKSC_PARAM. Sidecars, in short, but not XMP sidecars, so they won't be readable by other software. Also available for download is the 7.08-MB PDF User's Manual. The Introduction explains that support in NX-D for images edited in NX or NX 2 is "limited to images modified using the tools in the 'Base Adjustments' (Capture NX) or 'Adjust' section (Capture NX 2)." Also of note, JPEGs or TIFFs converted to NEF in NX or NX 2 are seen as JPEG or TIFF images by NX-D. You can't edited them using the NEF exposure compensation and white balance tools. With the release of Capture NX-D, Nikon said that Capture NX 2 is no longer supported. While Capture NX-D apparently offers NEF conversions that match Nikon's in-camera JPEG renderings, it loses the local edits features like U Point technology brought to Capture NX 2. Still the NEF conversions may, in themselves, be a sufficient reason to install the free software. No one's ever complained about the actual Raw conversions that Capture produces and as far as I can tell, Nikon has done the same thing as before with the new NX-D version: install the JPEG rendering engine that's in EXPEED as a callable routine underneath the software UI. In other words, we're still dealing with the same basic black box that does the interpretation of Raw data. It's just that a different UI is living on top of it. We found the user interface issues to be significant enough to eclipse any image tweaking advantages Capture NX-D might have. And on that score, we're far from convinced it does have any. But we do find it useful as a utility to check focus points, for example. And the price is right.